Please let us pray for you. We especially welcome petitions from children. 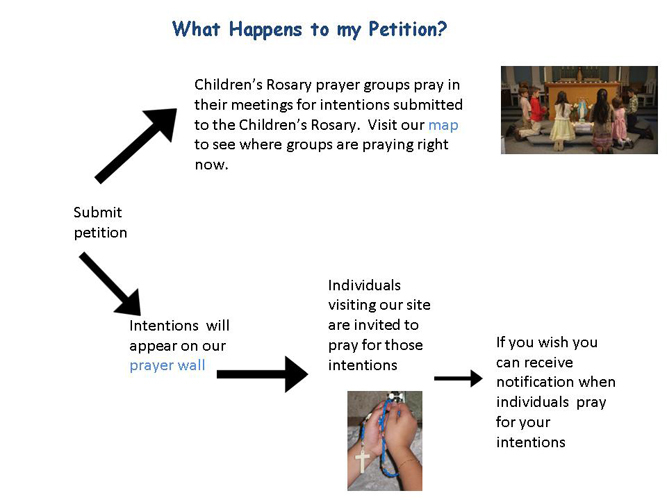 All submitted intentions will be prayed for by members of the Children’s Rosary. They will also be posted publicly on our prayer wall. We ask that when referring to a specific person in a prayer intention please use initials for privacy reasons. You may also consider writing “special intention” if you would like to keep the details of your petition private. The Children’s Rosary reserves the right to respectfully edit or remove petitions from the prayer wall. The children feel honored to pray for your intentions. For those who are able to assist the children in continuing this Apostolate please consider making a tax deductible donation.